Gem-Bodied Creatures are enemies that Wario faced during the events of Wario World. Wario first encounters one in Greenhorn Ruins, and they continue to appear in every subsequent level except Mirror Mansion. Gem-Bodied Creatures resemble huge crystals with a torso and head on top. They come in three colors: red, yellow, and blue. Red Gem-Bodied Creatures possess a sun-like design for their face, blue ones feature a moon design, and yellow ones feature a star design. A Gem-Bodied Creature may show up by dropping in from the sky or rising up out of the ground. In either case, the Gem-Bodied Creature will form a barrier around her general area, forcing Wario to fight her before he can move on. Gem-Bodied Creatures are completely immobile. Instead, they summon smaller Crystal Creatures to attack Wario. The Crystal Creatures come in two varieties: ground and flying. The ground ones wield weapons to hit Wario with and the flying ones can dive-bomb him. Wario can use them to damage and defeat the Gem-Bodied Creature; after knocking them out with some punches, he can throw them at the Gem-Bodied Creatures to hurt her. This is the only way to damage Gem-Bodied Creatures, as they are immune to Wario's regular attacks. After being hit, Gem-Bodied Creatures retaliate in one of three ways, depending on their color. Red Gem-Bodied Creatures emit a laser beam that sweeps upward. Yellow ones fire multiple purple energy blasts in a straight line. Finally, blue Gem-Bodied Creatures fire three homing lasers at Wario. These attacks can also damage the Crystal Creatures. 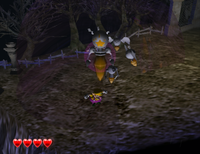 Once a Gem-Bodied Creature has taken three hits and is dazed, Wario can then pick her up, which will immediately end the battle and remove the barrier. After that, any one of Wario's moves, or even simply dropping the Gem-Bodied Creature, will destroy her. This Gem-Bodied Creature is located after the first chain on a large circular platform. It is fought in Greenhorn Ruins. Horror Manor's Red Gem-Bodied Creature can be found on the top of the round building on the exterior of the manor by the light blue button. The red Gem-Bodied Creature in Wonky Circus is naturally fought after dropping down from the floor above. When approaching the first graveyard on the Manor's exterior, near the white fence is where the yellow Horror Manor Gem-Bodied Creature is. After going down the middle of Shivering Mountains's ice slide, Wario should land right next to this yellow Gem-Bodied Creature. The yellow Gem-Bodied Creature is on the far side of the pyramid right at the start. It is located in Pecan Sands. The blue Gem-Bodied Creature of Wonky Circus is located in the middle of the first circus ring. After the second Battle Ring, the blue Gem-Bodied Creature is fought on a flower. The final Gem-Bodied Creature is located on a large flat surface close to the start of the level, and the wind traps. It is located in Pecan Sands. The "face" of the red Gem-Bodied Creature greatly resembles Mario's life counter in Super Mario Sunshine. ↑ Wario World Nintendo Power Player's Guide, page 26. ↑ Wario World Nintendo Power Player's Guide, page 38. This page was last edited on March 5, 2019, at 23:08.